Western Union was in the news this week with its revival of the singing telegram – although updated to include e-mail delivery. This company of course has a deep history of sending telegrams, whether the most urgent kind or the singing variety. 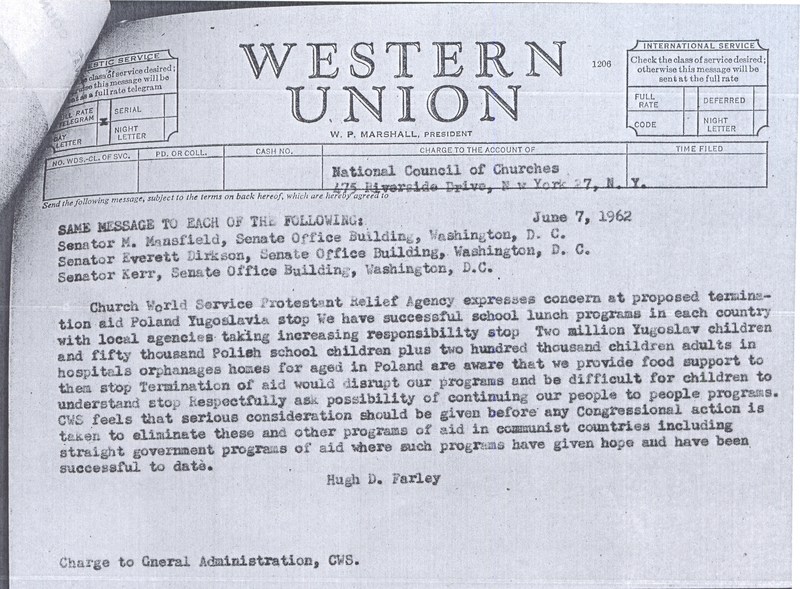 One day in 1962 a Western Union telegram was sent to Congress urging them to save a program that provided school meals to children in Poland and Yugoslavia. In June 1962, during the Kennedy administration, Congress was considering termination of aid to Poland and Yugoslavia, both under Communist control. Hugh D. Farley, the director of Church World Service, was upset with this prospect and sent a telegram to three Senators. Farley urged the senators not to cut food aid programs in these two countries that were reaching over two million children with school meals. Orphanages and homes for aged were also receiving food support. Farley told the senators the cutting of aid would be “difficult for children to understand” and that “people to people” programs should be continued. He also alerted George McGovern about the telegram. 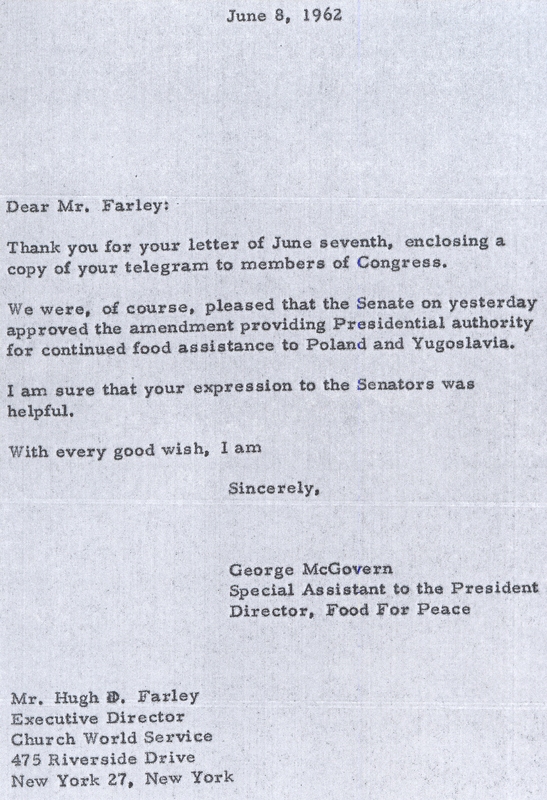 McGovern had been appointed by President Kennedy as the director of the Food for Peace program that oversaw these food aid initiatives. Food for Peace was started by President Dwight Eisenhower and President Kennedy continued and strengthened this program, placing special emphasis on school feeding. Saving meals for children was the right thing to do in 1962 and it is right again in 2011. Church World Services is urging the same type of advocacy by citizens to tell Congress not to cut food aid programs in the upcoming budget. The Food for Peace program, as well as the McGovern-Dole school lunch program, are at risk of budget cuts. With famine in East Africa and many other hunger crisis points unfolding, food aid needs to be bolstered, not reduced. There is also quite a controversy over why Congress is making cuts to food aid since it already is such a relatively inexpensive program. Food aid makes up less than one tenth of one percent of the federal budget. International assistance programs, such as food aid and other programs like malaria treatments, come out to around 1 percent of the total budget. The relatively low cost of these aid programs is not widely known either. 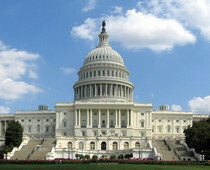 Save the Children, World Vision, the World Food Program USA and other agencies are urging Congress to save food aid from budget cuts. They are asking citizens to make their voices heard before it’s too late. Calls, e-mails, tweets, faxes are all being urged for reaching your representatives. A singing telegram? Well, if it works. Why not? Article first published as Singing Telegrams, Congress and Food Aid on Blogcritics.